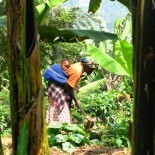 This summer I had the privilege to go to Uganda and spent five weeks in the Kabale region. One of my favorite part of the trip was to visit a traditional healer and his two wives who are also traditional birth attendants. It was my pleasure to meet them in person so that I could learn about the traditional medicine. Before I met the traditional healer and his wives, I learned that the majority of the population come to the traditional healers to seek medical care, and the traditional birth attendants deliver most of the childbirth in the nation. It can be a challenge because many women die related to birth complications. Most of the traditional birth attendants do not have proper medical tools such as gloves, surgical knife, and soap at their clinic. Mothers who come to deliver the baby there, they have to bring gloves, plastic sheet, and surgical knife with them. If they do not have it, the traditional birth attendants will use the tools that they have at the clinic. However, it is not safe for both mother and baby because they can be at risk to get HIV/AIDS, infections, and other diseases. KIHEFO educates traditional healers and traditional birth attendants about safe delivery techniques. Moreover, KIHEFO provides free Mama Delivery Kits to the traditional birth attendants and pregnant women so that they can deliver their baby safely. When I met the traditional healer the first time, I was not sure what I should and should not ask him without offending him. However, he was really open to talk to me and show me around his clinic. He also showed me which herbals he would use to treat cardiovascular disease, depression, allergy, food poison, and other illnesses. Herbals can be in many different forms, including essential oil, capsules, and tablets. As a public health student, it was interesting to see the collaboration between the traditional medicine and Western medicine. Even though the traditional medicine and Western medicine have different methods on how to deliver health care services to patients, they both focus on the well-being of the patients. I’m glad to know that KIHEFO and the traditional healer establish a friendship relationship, so they work together as a team and learn from each other. For example, if the medical team does not know how to treat mental illness like depression, they will give that person a referral to see the traditional healer so that the traditional healer can do ritual performances to scare evil spirits away. On the other hand, the traditional healer will give patients referral to seek medical care in town if he sees any health complications. At the end of the visit, the traditional healer showed me a book, which has many different types of herbals, was donated from KIHEFO, and it is written in both English and native languages. The book is so helpful which can help the traditional healer to identify the right herbals and how to use them. The book is also used among medical team so that they can learn more about the traditional medicine. By the end of the trip, I had learned so much about the health care system in Uganda. I can’t wait to come back again. This entry was posted on July 19, 2018 by KIHEFO in Welcome from KIHEFO.